Except, for some reason, I actually woke up. It sunk in... the news the doctor was telling me, the words he said. I had been kidding myself for quite a while. I really wasn't in shape (not any shape at all). Sure, I could function - I was having fun, cooking, eating, and just living day to day. But, along with that, I was tired. My pants didn't fit - in fact, I had a whole shelf of clothes that didn't fit anymore. Its easy to ignore that. A quick shove to the back of the closet, and Voila. Out of sight, out of mind. Those jeans that fit last year, well lets just hide those under the sweater. You know the sweater: the big, bulky loose sweater that hides the extra few pounds: the FAT sweater. And so what if my blood test numbers weren't that great: everyone's cholesterol numbers go up with age. Right? Well, that's what I was telling myself... and given America's stats, its almost easy to believe. But, if you asked me, I'd just say.. oh, that's a bad photo. Must be the angle or the shirt. Yeah. That's it. Was I unhappy? Heck, no. If anything, I'd say the opposite. I was perfectly happy. Content. Maybe even happily lazy. YES- Lazy. Sure, I was a working mom. Sure, I had two kids to keep up with, a full-time job, a husband and a house to take care of. But, I could still be lazy. Seriously. Even this picture didn't wake me up. But, luckily for me, that day did come.The one day when I actually did wake up, when I could see clearly. I saw how UNHEALTHY I had become. How complacent I'd become. Sure, I could still function - work, play and be me. But, it wasn't what I really wanted to BE. And worse, if I kept going that way - ignoring me and my health - I'd surely be hurting my family as well. So, I started making changes. Some big: I became a vegetarian: meat just wasn't going to fit in with my where I wanted my diet and my health to go. Some small: I decided that organics were the way to go whenever we could - our health would thank us for it (even if our wallet won't- LOL). Then, I joined the Greer Athletic Club. I quickly fell in love with the Group Centergy (think yoga & pilates mixed and set to music) and Amanda's teaching of it... I struggled to go each and every class - well, except for the 5:45 am one - I'm STILL not that dedicated! And I did- for months I didn't miss a single class. I did something else simple. I kept a food journal. And, YES, there's an App for that! My choice was Lose It! Really - it showed that there was no magic. I had to work to burn those calories. I had to watch how many I ate. I had to DO the exercise so I could log it. Fast forward to November 2010: I did lose it,.. with the classes, the running, the vegetarian & organic diet... I lost it.. to the tune of about 60 lbs so far. And I did run the 5K. And, you know what - WE even had fun doing it. That's right. My family & friends ran it too. That makes me happy - very happy. And proud. I'm not done yet... to be honest, I won't ever be done... because its taken me a while to realize that health is not a single act. Its not something that can ever be "done" - I'll just keep working at it. Sure, I'm going to stumble, I'll make mistakes, I'll falter (oh yea, I AM going to eat those Christmas cookies AND the Gingerbread Caramel Popcorn). BUT, I'll get back on track because I know what my long term goal is: I want to be healthy for myself and my family. I want to be around, a good long time - I want to be a mom, a wife, and even a grandma someday. I was just talking to a friend the other day - a weight watcher like me - who said it's funny.. I was fine and happy and then one day realized I was overweight..opened my eye.. it's funny how that switch just has to flip. 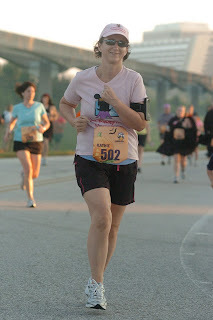 Congratulations on your first 5k! And what major life changes! I'm sure your family is loving it. I wish we could all find that "switch" and flip it- wouldn't that be a huge breakthrough??? The 5K was actually a lot of fun. Its really a different perspective when you can get out there and do something with friends and family. Its that support base that makes such a difference! Wow, wow, wow! Makes me even more excited to meet you! You must be so proud! Mo! You're so sweet. And its incredibly funny to think that you are excited to meet ME! LOL! I can't wait to meet YOU!!! It is so uncanny that you post this today. I just started a running program this afternoon. I'm really hoping that I stick with it. I haven't run regularly since high school, and I have had such a terrible time with "stick with it-ness". KATHIE! This is amazing. You have done such a great job!!! I started at the end of July and have lost a little over 30lbs, on my way to my goal of 60-65lbs. It's incredible what a difference keeping a food journal can make!!! Way to go Amy! You are awesome! You've gotten started and stuck to it! You should be so proud of yourself- I am proud of you! JL - Just let me know if you ever need a "pep" talk! It really helped me to have the goal of running in October at the 5K. And you're closer to the Mouse, so you have a few events you can do throughout the year. They are so much fun, and so worth working for!! You can do it! I know it!